The Suns, by any measure besides championship banners, are one of the most successful franchises in NBA history. They missed the playoffs just seven times from 1975-76 through 2009-10, with 19 50-win seasons in that span. But they’ve missed the playoffs three straight years now. Last season, the first of the post–Steve Nash era, might rank as the most depressing in the modern history of the team. Phoenix has since acquired Eric Bledsoe and Caron Butler in a three-team sign-and-trade that Phoenix hatched with Milwaukee and the Clippers, but they still figure to be among the dregs of the league as a new regime enters an earnest rebuild. 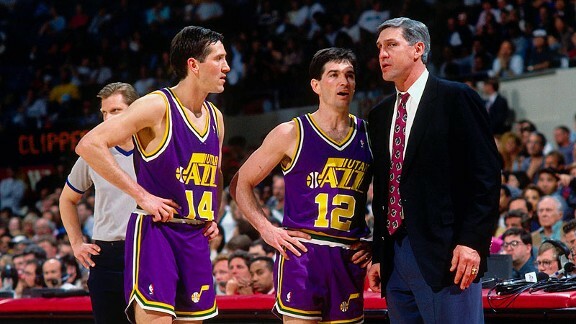 The Suns, like several others in this crazy summer of coaching hires, settled on a first-time head coach to helm that rebuild — Jeff Hornacek, the sweet-shooting combo guard who played a crucial role on the 1980s Suns and 1990s Jazz. Hornacek got the head job in Phoenix after a half-decade as an assistant in Utah, where he began as Andrei Kirilenko’s shooting coach. He spoke one-on-one with Grantland in Las Vegas this week about the challenges ahead. Ryan McDonough, the team’s new GM, says you blew him away in the interview process with your preparation — your knowledge of the team’s roster, and your plans for how the team should play, especially on offense. So: What’s that offense going to look like after a year of struggling to find an identity without Nash? Wait, now. “Seven seconds” is a buzzword in Phoenix. Yeah, yeah, let’s stick with eight. Statistics say in the first eight seconds, you shoot a much higher percentage. A lot of it depends on what kind of players you have. I knew they had [Goran] Dragic, who can fly up and down the court. And obviously now, with Eric Bledsoe, those two guys jell perfectly. You guys were either no. 1 or no. 2 in midrange jumpers, and fell way below the league’s average in 3-point attempts. Do you want to change that? Oh, yeah. We gotta get rid of that long 2. I’m not opposed to the middle jumper, in that 15- or 16-foot range. I think all but two teams that were in the playoffs, their effective field goal percentages were above 51 percent. If you can shoot 15-footers and shoot 52 percent, OK, you’re beating the average. You can’t totally discount those shots. Especially as defenses get better, sometimes they are the only open shots you can get. You’re not getting a corner 3 or a dunk every time down against the Pacers. Right. We’ll take a look at it all. But the ones we have to eliminate are the ones that are within 4 or 5 feet of the 3-point line. Those are low-percentage shots worth two points. What kind of system are you going to lean on? Every team is a pick-and-roll team to some degree, but what kind of stuff will serve as the bread and butter — side pick-and-rolls, the old Utah flex, Rick Adelman corner stuff, or something else? You have to get a read on your players and what suits them the best. When you look at the game today, with the rule changes — that’s why everyone is going to some sort of pick-and-roll. The rules are, you can’t touch that guy with your hands. It’s not like the old days, where you could hand check. You played with some guys who were pretty good at that handchecking thing. Right, right. It gives such an advantage to the point guards out there, if you have a good one. And we have two of them. If you can execute well, you’re going to get good shots. Everyone wants to know if you can really play Goran and Eric together defensively — if Goran can really defend shooting guards. But look across the league: How many teams have backcourts that really scare you, in terms of giving up size? You’re gonna hit those teams. Sure. But it’s not like you’re scared to play smaller against Mike Conley and Tony Allen, or Tony Parker and Danny Green, right? There aren’t that many Kobes out there. Right. There will be some mismatches you have to worry about, but we think that with the tag team of Goran and Eric — Eric’s got the bulldog strength, so that if we want to try to keep a bigger guard off the post, maybe he’s better suited to that. We can tag-team a great player like a Kobe. We can put someone on him for a little bit, and then stick another guy on him and change the look, and have someone with full energy on him at all times. Will one of them emerge as the “point guard” — the one who really handles the ball 75 percent of the time? Or will it be an even split? Does it even matter anymore? No. Sometimes it might shake out one way or another, but our vision is to be a good rebounding team, where we can just get the ball and hit the first guy you see. And in our set offense, depending on the plays we run, maybe it’s Goran one time with Eric off the ball, but Eric goes on the ball for another set of plays. We’ll have to get a feel for it. Bledsoe’s pick-and-roll stats were off-the-charts awesome last season, to the point it surprised me. Will that change as he plays 35 minutes, a lot against starters, and maybe as teams don’t go under screens against him? Is he ready to be a starter? We’ll find out. When we got Kevin Johnson from Cleveland, he was a backup point guard. And then Cotton [Fitzsimmons] throws him in to be a starter, right alongside me, and he just took off. Eric has been champing at the bit for at least a year now, maybe two, to show he can be that guy that plays 35 minutes a game. Is there room in the league for posting up anymore? Will we see Marcin Gortat get 10 post touches a game? Absolutely. If you can find a guy that can post up inside and be effective, whether it’s a center, power forward — heck, you could put a point guard down there. It’s the same concept of creating some sort of double-team that allows you to have a four-on-three. Whether we do that from the post or with pick-and-rolls — we’ll figure that out. Yeah, it seems like teams use post-ups more now as a way to create passes rather than shots. You can use it that way, depending on who it is. I mean, when you watch Miami play, you can stick LeBron there in the post and let him dictate what’s going to go on. But you do hope your good post-up players offensively are good passers. Then you can really do different things. Here’s a very important question: You’re wearing a polo shirt right now with the new black-and-orange Halloween-style Suns color scheme. Do you like that, or do you miss the blue/purple? Oh, come on. You miss the blue. You can admit it. Or is it purple? It’s purple. We actually had a uniform in Utah that was pretty much the same colors as these — almost a black and copper. And I really liked them! I don’t know if the people liked them, but I really did. You missed the 50-40-90 club as a player by tenths of a percentage point multiple times — like you shot 50 percent from the field, 40 percent from 3-point range, and something like 89.5 percent from the foul line. Do you care about that? I never really thought about it playing. It seemed like I was one free throw away from 90 percent for five or six years. But I was just playing the best I could. What about in retrospect? It would haunt me. I’d never get over it. I guess it’d have been nice, because how many guys are in that club? They’re all great players. Oh well. Now that you’re inside, what have you learned about the Suns training staff and their black magic? I knew nothing about these guys before I came! I know Aaron Nelson [the team’s head trainer] is your brother-in-law. But now you’ve seen the whole operation. You know what they do? They just get on guys and work them every day, and guys buy into what they’re doing. My brother-in-law has worked on my knee, and it’s not fun. It hurts a little bit, but you feel so much better. And when players put their trust in those guys to work on them, they might make them a little sore, it might hurt a little bit, but the next day, they feel better. You guys hired Mike Longabardi from Boston. I assume this means you’ll run the Tom Thibodeau defense that swept the league — trying to keep all pick-and-rolls toward the sideline, on one side of the floor, and dropping your big men back into help position instead of having them trap up high like Miami does? I always like to keep the ball on the side. When I played point guard, and I got stuck on the side, it was always more difficult for me than when I could get around and into the middle of the court — where I could see everything. There are so many more things that become available when you get into the middle. That’s what I like to do, and we hired Mike, who has run Boston’s defense the last three years. We’ve looked at a lot of things they do, I’ve watched them, and I see a lot of things I like to do. So we’ll go that way, and if things don’t work out, we’ll adjust. What does Michael Beasley have to do to save his career? Michael’s such a talented player that he sometimes looks like he’s not playing hard. And that’ll be the thing when he comes into training camp — that every play, he has to play it like it’s a game winner. From watching tape, he has a tendency to just kind of go through the motions both offensively and defensively. We’re just gonna ask for effort, day in and day out, play in and play out. If he does, he’s got a great chance to contribute. Do you like small ball? All the big teams did really well in the playoffs this season. The difference is that when you’re small on the defensive end, when teams break you down, you can really get in trouble. You have no real shot-blockers, and the rebounding gets tough. Obviously, I think there’s a use for small ball. Did you ever go hunting with Karl Malone? I did not. I’m not a hunter. Me neither. I just thought he might have dragged you guys out with him once or twice. Are you still in touch with John Stockton? Oh, yeah. I talk to those guys. John is doing what I did for several years, which is just watching your kids grow up. When I was in Salt Lake City, he’d fly there, sneak in, and sneak right back out. Do you have a favorite Stockton story? I mean, he was hilarious, but he never opened up to the media. Did you see that bit in the Dream Team documentary about Stockton walking Las Ramblas, playing around with fans who had no clue who he was? Geez. Even after that game? Oh, yeah. Even that game. We got in there, got our stuff, and he dragged me out of there quickly to avoid all the craziness. Typical John. You mentioned effective field goal percentage before. People tell me you’re a numbers guy. What numbers do you like to use? I’m a math guy. I was an accounting major, so I like numbers. I look at all that stuff, and I use it as kind of background information. When you look at a five-man lineup, sometimes that’s helpful, and sometimes it’s not. You don’t know who they’re playing against, for instance. The one thing I really like to show players, which I don’t think a lot of them actually look at, is just simple shot charts. Where do they shoot the ball well from? And where don’t they? You’d be surprised how many times I ask a player, “If I make a play for you to shoot from the free throw line, that’s a great shot for you, right?” And the guy will say, “Oh, yeah, absolutely.” And then I’ll pull out the sheet and show him he only shot 34 percent last year from that spot. I don’t think they understand where they shoot well from. Did you? I guess you shot the ball well from everywhere. Ha, yeah, I guess. But it probably would have been helpful for me, too. How did your role in Utah evolve under Jerry Sloan, and then after he left? I retired to watch my kids grow up. I was doing nothing for a while. And then they called me. Andrei had a little confidence issue in 2007, and he asked the Jazz if I’d come up there and work with him. I did that for a little bit, and the next year, they wanted to know if I would come in every week. So I’d come in the morning one day, worked with guys before and after practice, and flew home. I was able to schedule it around my kids’ games, and it worked out great. I did that for a few years, with guys like Kyle Korver and Wes Matthews. Kyle Korver needed help on his shot? Yeah, he asked. And that’s what I told him: “You really don’t need a lot.” But if you remember, back in the day, he shot with a pretty flat shot, and he’s got the arc better now. That was probably the only thing we ever had to work on with him. “When that whole thing happened” is a nice way to describe that. Yeah, when that whole thing happened, they called me and said, “You know the players, you know the plays, could you stay on with the team?” My daughter was going to be a senior in high school, so the timing wasn’t quite right for it, but at that point, I said to myself, I better do it now. It’s a good opportunity. Did you ever think you’d be an NBA coach? I always thought I’d be a college coach, just because I thought the college level would be the best level to teach kids all the stuff that I had learned, and to get them prepared for the NBA level. But the way the league is now, a lot of these kids are one-and-done, and going through all the AAU stuff, you have to teach them. It’s fun for us, all us coaches, to just teach these guys how to play the little angles and the little nuances of the game. Did I ever think I’d coach on the NBA level? Probably not.